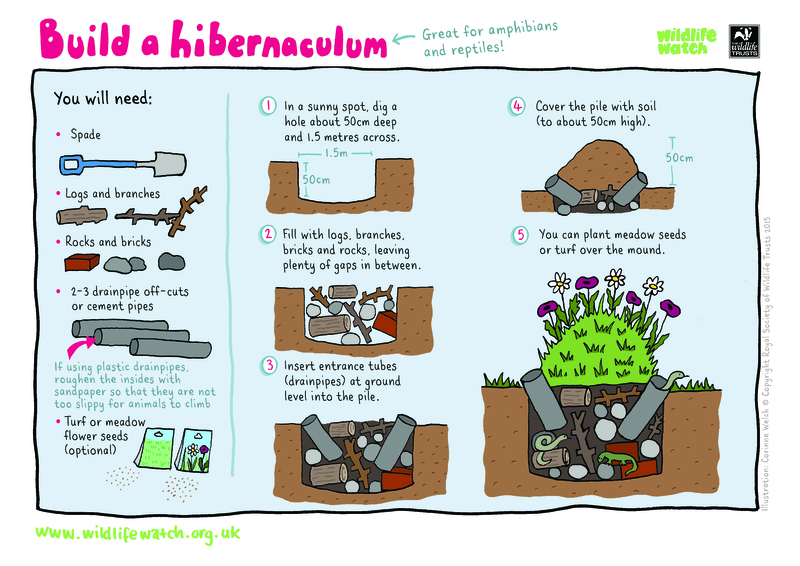 Wildlife Watch - What is a hibernaculum? Hibernaculum, it’s a very strange word isn’t it? Pronounced hi-bur-nak-you-lum. To me it sounds like a mysterious and magical place! And it really is a magical place for many animals who wouldn’t be able to survive winter without it. Hibernacula (this is the word for more than one hibernaculum!) are places where wildlife goes to hibernate during the winter months. Usually from around October until March. All kinds of creatures use them, like bats and insects. But when we talk about them we usually mean the places that reptiles and amphibians go. Hibernacula have been around as long as animals have hibernated. But we have only called them that since 1789, that’s over a 100 years ago! What makes it a hibernaculum? Hibernacula are underground chambers. Amphibians and reptiles use them in winter as a safe space for them to hibernate away from the worst of the weather – it’s warmer underground and doesn’t freeze! They can be burrows, crevices, piles of stones, sticks and logs or thick piles of dead leaves. Most animals need to be warm to survive, so it means they are at risk in the winter. This is especially important for both reptiles and amphibians as they are cold-blooded. So how do they survive in the cold? Reptiles and amphibians can’t control their own body temperature like mammals and birds. They get all their warmth from the sun and their surroundings. In the UK our winters are too cold for them to act as they normally would, and they completely stop moving! This is a bit like hibernation but is actually called “brumation”. It’s a bit like they are put on pause (like pressing pause on your TV!). Often reptiles share a hibernaculum, if they’ve found a good spot. Adders are even known to curl up together to keep warm whilst sharing the space with other species. So you might get different snakes and lizards all in the same hibernaculum! A great way to help wildlife in your garden is to create a hibernaculum for them to hide away in come winter. You can even plant meadow seeds or turf over the mound when spring comes, helping pollinators too!